OS X gives you a simple and effective way to back up everything on your Mac with Time Machine, but what about your Boot Camp Partition? While Time Machine will save everything you want once an hour, one thing it can’t do is save a Windows partition, which Boot Camp just happens to be. This means that you have two options. First, you can back up within Windows using one of these tools, but the more effective way is to back up Boot Camp from inside OS X, giving you the ability to use the same hard drive for both the Boot Camp backup and Time Machine. 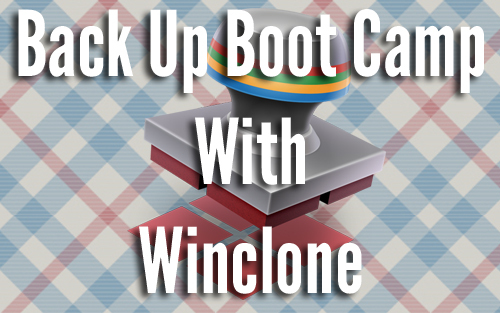 The most effective way to back up a Windows Boot Camp partition is with Winclone. While the software will set you back $30, it’s the easiest and all-around best way to get the job done. Click on the Winclone menu it the Menu Bar and select Preferences. 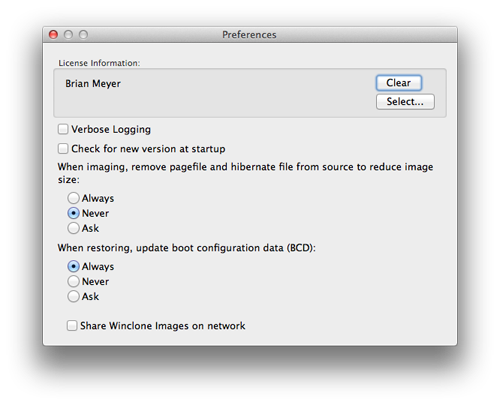 At the top of the Preferences window, click Select… under the License Information section. Navigate to where you saved the license file and click Open. 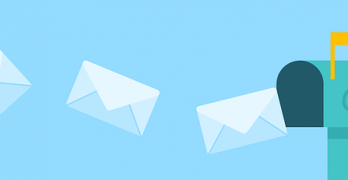 You’ll get a confirmation message and your name and email address will appear in the License Information section. Close Preferences and you’re ready to start. The first step to any Boot Camp Backup should be to run CHKDSK from within Windows. Most backup errors come from issues that CHKDSK can easily fix, so do this first. I’m not going to get into how to do this, but TwoCanoes has a great tutorial here. 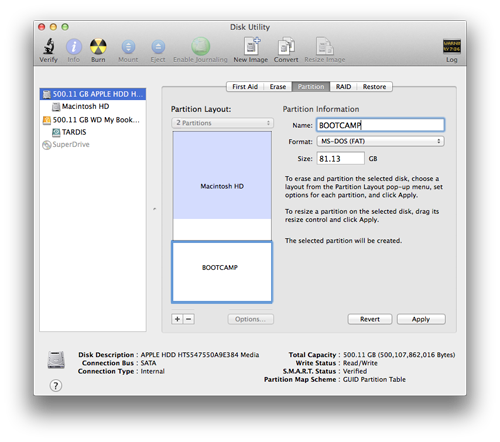 Assuming you only have one Boot Camp partition on your Mac, you should only see one BOOTCAMP drive in the column to the left. Click on it, and you’ll get a Winclone icon in the main window that says Save Image under it. Click the icon and a check should appear on it. Before you save the image, Winclone gives you the ability to shrink the file system to make it take up less space. This is great not only for storing the backup, but in case you have to install the backup to a smaller partition size. To do this, make sure the BOOTCAMP partition is selected, then click the gear icon in the bottom left corner and select Shrink Windows (NTFS) File System. Doing this makes Winclone ignore the free space on your partition so it only backs up the filesystem itself. This could mean a huge amount of space saved, depending on your Windows installation and partition size. This will take some time, so go grab a coffee while it’s working its magic. Once the shrink is complete, you can move forward with the backup. 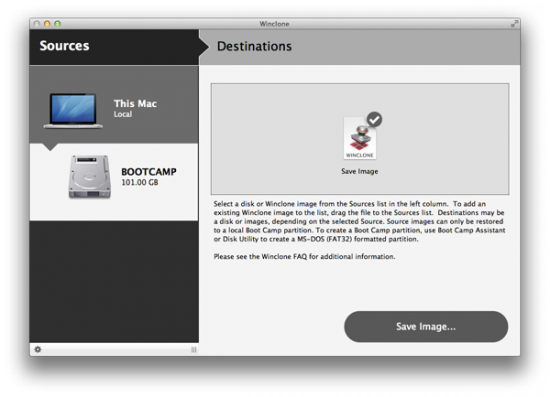 Winclone will make an image of your Boot Camp partition so it’ll be easy to restore later. Make sure the drive is selected ant that the Save Image icon has the check, then click Save Image. You’ll get a warning that asks you about CHKDSK, as long as you ran it, click Save to continue. A save dialog will appear. Give your backup a meaningful name, ideally containing the date you’re doing the backup and a computer name if you’re saving multiple machines. Select the drive you want to save it to and make sure the drive has enough storage available for the backup (mine is 55GB, so it’s a doozie) then click Save. The finished file will be less than this total size, but it’s best to make sure you have more than this available. If you have questions about file size check out the Winclone help document here that explains what all the numbers mean. Note: I plan on keeping my backup on my TimeMachine drive but to do this, I’ll need to save it to another drive first, since Time Machine drives don’t like you saving to them automatically. For this example, I’m saving the backup to my desktop. Make sure you have enough space before doing this. The process of saving the image will take even more time than the shrinking, so just let Winclone sit there and do its thing. If you can usually see your Boot Camp partition as a drive on your desktop, you’ll notice that it disappears while the process is happening. This is because Winclone un-mounts the drive to back it up. Another thing you should notice is a Winclone icon that appeared on your desktop. That’s the archive building itself. 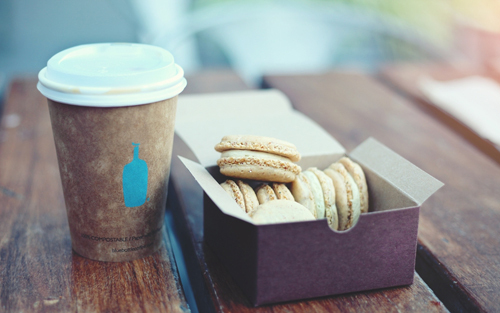 Go grab another coffee and some cookies. You have the time. Once the backup (finally) finishes, you’ll be left with a Winclone image of your drive. You should now see the new Winclone image in the Sources column. Before you do anything else, move the completed archive file to the drive you’re saving it on. For this example, we’ll be storing the backup in a folder on the Time Machine drive. 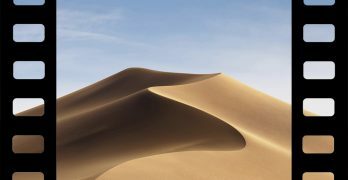 If you’re storing the file on your Time Machine drive too, you’ll need to authenticate with OS X to transfer the file. 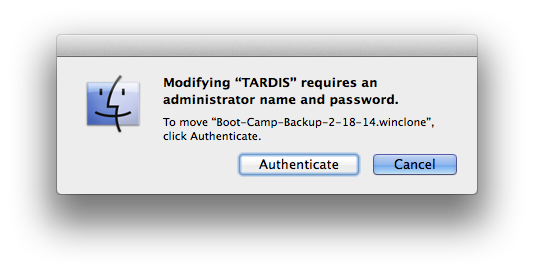 Drag the Winclone file to your Time Machine drive in Finder and click Authenticate in the window that appears, then enter your admin credentials (and yes, my Time Machine drive is named TARDIS). Once the file has been moved to the external drive, it’s ready to be restored. Important: You must expand the Boot Camp drive before trying to log into Windows again, so it’s a good idea to do that now. 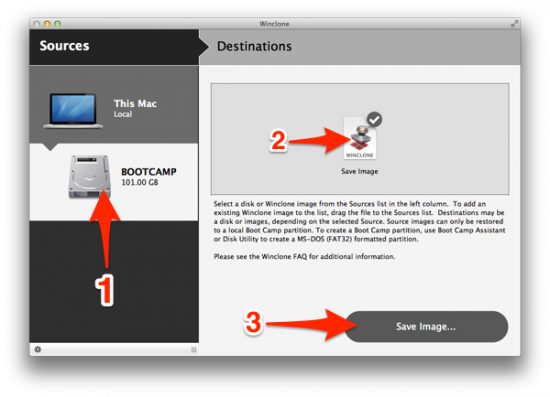 To re-expand Boot Camp, click on the BOOTCAMP drive in the Sources column in Winclone, click the gear icon in the bottom corner, then click Expand Windows (NTFS) Filesystem. This will put your Boot Camp partition back to normal and allow you to use Windows again. Next, we’ll look at restoring a Winclone backup. Once the backup is complete, it’s time to restore. Before you restore however, you need to prepare your Mac to accept the Winclone file. This involves installing Winclone and creating a new partition for Windows. Since you’re not using Boot Camp Assistant to install Windows, you can use Disk Utility to get this done. 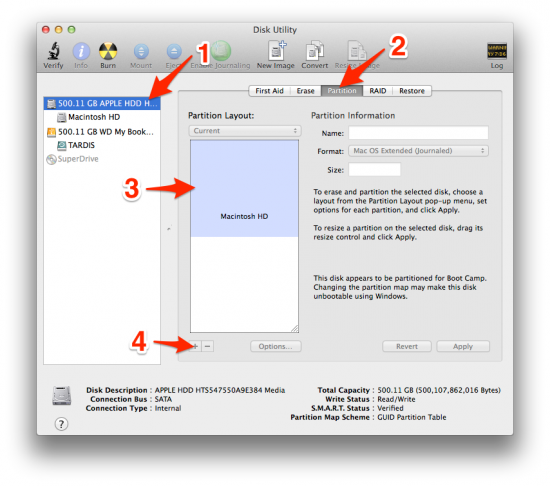 Open up Disk Utility (Applications > Utilities > Disk Utility) and select your Mac drive. Click on the partition tab, click the partition itself, then click the plus sign at the bottom of the window. When the settings are complete, click Apply. If you need to start again, click Revert and start again. Once the new partition is in place, you can restore the backup. If you moved your Winclone file to an external drive and removed the one on your desktop, you’ll need to tell Winclone where the new file is. First, you need to remove the reference to the original in Winclone by right-clicking on the Winclone file and selecting Remove Image from list. This does nothing to your files, it only removes the reference in this list. To add the moved image back, just view the Winclone file in Finder and drag it into the Sources window. Now when you select the Winclone file you should see BOOTCAMP as a destination. If you’re moving to a new system, you’ll need to create a Boot Camp partition before restoring the Winclone file. The easiest way to do this is with Disk Utility. 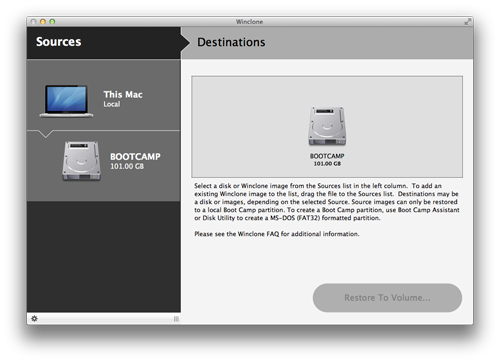 Once the Boot Camp partition has been created, you can restore to it without installing Windows or any other OS. Winclone does that work for you. 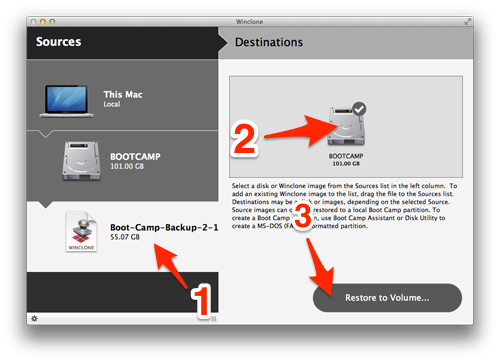 Select the Winclone file in the Sources column, click on BOOTCAMP, then click Restore to Volume. Once the file starts to restore, it’s time to go get another coffee, since this will definitely take some time. Once the restore is complete, you will have a fully bootable Boot Camp partition identical in every way to your original. If you have any questions or need some more help walking through this process, check out the help files available from TwoCanoes. There’s a lot of information available here. 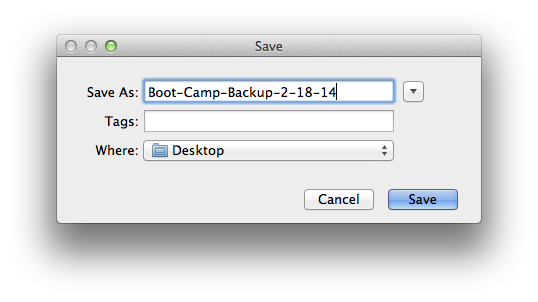 While it’s a great idea to keep regular backups of your important files and systems, backing up and restoring a Boot Camp partition is also useful if you need to resize your partition, something that you can’t do without a backup and restore. Let’s say you have a 50GB Windows partition and you run out of space. You’d be stuck having to do a complete reinstall of Windows on a new Boot Camp partition without Winclone. With it, you can back up Boot Camp, clear the drive off, make a new partition with more space, and restore your backup. When you log into Windows again you won’t know anything happened except now you have more space. Backing Windows up from within Windows is tricky to say the least and definitely more difficult that using Winclone. 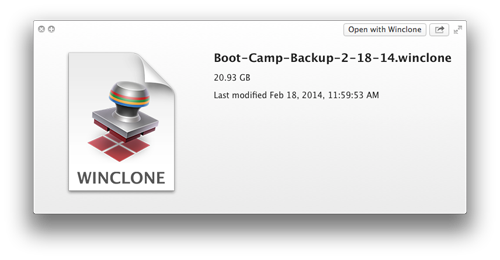 For $30 it’s the best way possible to keep your Boot Camp Partition backed up and safe. Thanks a lot, Brian, this post of yours is quite helpful. I was searching for a good recommendations on how to backup/restore my Windows Boot Camp and also for expanding the partition size. By the way, when restoring from a shrunk file system backup I should expand the Boot Camp drive before trying to log into Windows again. Is that right? Very well done, Brian. I am in your debt. Great Article! I had an issue with 10.3 and creating the Boot Camp partition, that took apple support & terminal commands to reformat the new Mac Mini’s 1T HD. By default File Vault was ON during the install. After the USB installer was made, and the HD split into 2 equal parts. (MY PC Dental Xray Sensor Drivers/Capture app won’t work in a Virtual Windows, so I had to do Boot Camp). It wouldn’t install-(DOS screen, blinking cursor, “Can’t find the OS”). Then Boot Camp Asst wouldn’t allow it to repartition back to 1 Mac partition. It remained as the mounted 500G Mac, and the BC partition didn’t mount. Disk Util said it was Named Freespace, Formatted as freespace. I Time Machined the Mac partition~ 150 Gigs, Had Support walk me thru the Terminal commands, and the HD repartitioned. I reinstalled the Mac partition from Time Machine, turned off File Vault, and Boot Camp partitioned & installed Win&Pro to perfection. MYQ: The Time Machine HD was suddenly renamed Wininstall, was completely erased, and formatted in DOS. I was going to use it as this Winclone article outlined, but can’t afford another mysterious Time Machine disappearance? Can you speculate what caused this and how to prevent it from happening again? Thanks. I cannot believe Apple made such a lame product. Boot Camp will split the drive and let you switch between different OS’s, and Time Machine will backup up a Mac automatically, but you need to install some third party manuall copy program to get a backup of the Boot Camp drive?! What kind of crap is THAT? !